Practicing mindfulness | MAX Solutions. The practice of mindfulness has been linked by a growing body of research1 with improved mental and physical wellbeing. Specifically, practicing mindfulness has proven benefits for people suffering from chronic pain, fibromyalgia, cancer, heart disease, anxiety, binge eating disorder, psoriasis, borderline personality disorder, major depressive disorder, and stress2. Benefits have also been documented for people who aren’t experiencing any of those things. In fact, mindfulness can improve performance, reduce errors, and improve happiness and life satisfaction3. 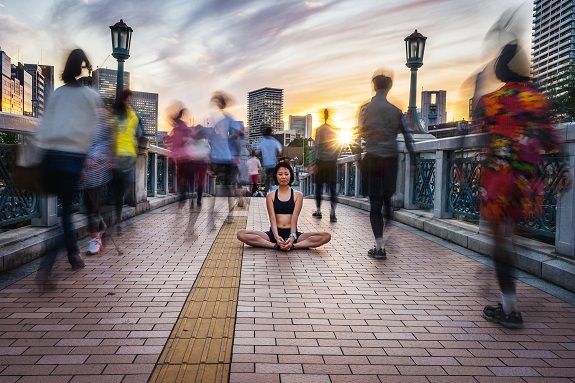 Mindfulness refers to the ability of being aware of and attentive to internal and external events, without becoming overwhelmed or feeling the need to react automatically. Mindfulness is an intense awareness of your here and now experience. It is a paradox in that you are fully aware of your current experience and yet detached from it too by the very fact that you are observing yourself with openness, curiosity and receptiveness. Acting with awareness - I choose my actions with considersation and awareness. There are many different ways to practice mindfulness. You can try a few things to find out what works for you. The most common mindfulness exercise involves observing your breath5. The advantage of this technique is that you can do it anywhere at any time. You can practice it now. Take a few moments, close your eyes if you wish, or focus on a blank spot on the wall. Notice your breath. Notice how it feels as it passes through your nose or mouth, down your oesophagus and how it feels as your lungs inflate. Notice how it feels to exhale. Do you notice your body relaxing? Or do you notice something else? How many of the five facets of mindfulness did you manage to incorporate? If you included two or more, you are doing well for a beginner. Challenge yourself to include even more as you practice. Can you be curious about your experiences? Can you notice your emotions as you breathe without reacting? Can you breathe deliberately? Sight: Five things you can see. Look around you; what colour are the walls? How does the light fall? Touch: Four things you can feel: How do your clothes feel against your body, your feet on the floor? Hearing: Three things you can hear: Can you hear the wind? Or the air conditioner? Smell: Two things you can smell: Do your clothes smell laundered? Or do they smell of you? Taste: One thing you can taste: You might notice your last meal or drink can still be tasted in your mouth. Or you can practice this one moment meditation. For assistance making mindfulness work for you contact your Employee Assistance Program (EAP) on 1800 629 277 or support@maxsolutions.com.au. 5. Doll, A., Hölzel, B.,K., Mulej Bratec, S., Boucard, C. C., Xie, X., Wohlschläger, A.,M., & Sorg, C. (2016). Mindful attention to breath regulates emotions via increased amygdala-prefrontal cortex connectivity. NeuroImage, 134, 305-313.